A great 3/4 size guitar pack at an unbelievable price! This complete package includes everything you need: an excellent guitar; a small, portable amp that delivers big sound; on line video lessons; a bag to protect your guitar when you are not playing; a strap to help you hold your instrument; a 10' cable to connect your guitar to the amp; and a guitar tuner to keep you in tune! 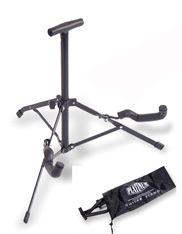 3/4 size is perfect for a person who is between 4'2" and 4'10", or for a larger person who just wants a smaller instrument (for perhaps when one travels). Dual cutaway allows access to the highest frets. Vintage fulcrum bridge with six adjustable saddles. Truss rod adjustable maple neck. For those of you who already own an amp, you now have the option of saving $15 and buying the package without the amp. A great guitar package for your young beginner! This scaled down, 3/4 size guitar is about 3" shorter and 2" more narrow than a full size guitar. It is excellent for a person who is between 4'2" and 4'10", or for a larger person who just wants a smaller instrument (for perhaps when one travels). People with back issues also enjoy this light weight guitar. Three powerful single coil pickups, one volume control, two tone controls, plus a five position pickup selector switch let you create an incredible range of sounds. Rosewood fretboard, 21 jumbo frets. The amp provides 10 watts of power through an especially designed 5 1/2" speaker. It has a Master Volume Control. The Two Band Equalizer allows you to control the bass and treble independently. Headphone jack keeps the household sane as you can practice silently. Amp weighs only 6 1/2 pounds. It is 9 3/4" wide x 10 5/8" high x 5" deep. Enjoy! Width of the neck at the nut: 1 1/2"
Width of the neck at the 21st fret: 2 1/8"
Thickness of the neck at the 1st fret: 13/16"
My son bought this with his Christmas money this year after reading the reviews and we have not been disappointed. The guitar is the perfect size for an older child or adult who simply wants a small, travel electric guitar. The amp works great. The set was a piece of cake for everything also. The video is also pretty good. Karen M on Amazon. Nicely crafted guitar - perfect for my 7 year old rock star wanna be! The extras are really a nice touch as well. You get a lot of bang for the buck with this purchase. As good as any guitar that would cost three times as much! by "march 13"
The case that comes with it is of much better quality than I was expecting. It is not flimsy. It is made of a thicker material and has some structure to it. That was a bonus. Question: How does this 3/4 sized guitar compare to a full sized guitar? Answer: This scaled down guitar is about 3" shorter and 2" more narrow than a full sized guitar. It is excellent for a person who is between 4'2" and 4'10", or for a larger person who just wants a smaller instrument (for perhaps when one travels). People with back issues also enjoy this light weight guitar. Question: How much does the guitar weigh? Question: Is the tremolo bar removable? 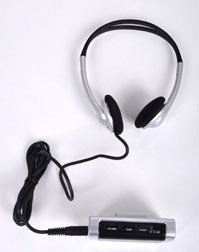 Question: "The included DVD player will not play on my Mac or PC"
SX HPA-301 Headphone Guitar Amp$19.95 On Sale!